The Clean Drains River Gains drain stencilling project commenced in June 2003 when the Bannister Creek Catchment Group and the Phosphorus Awareness Project received funding under a Water Corporation grant. This funding has been combined with funding through other sources to create a broad educational water quality campaign. The current campaign managed by SERCUL, aims to raise awareness of the link between drains and natural waterways. We all know that prevention is better than cure and preventing pollution is far better than struggling to undo the damage. But how many of us realise that the drains outside our homes and businesses are really an extension of our rivers, lakes and wetlands? Whatever we allow to enter the drainage system will find its way to the natural environment….often with serious consequences like fish kills, algal blooms, oil spills and the visual scarring of beautiful environments. Highlighting the link between drains and rivers is the aim of the Clean Drains River Gains Campaign that is being undertaken by the Bannister Creek Catchment Group and the Phosphorus Awareness Project. A similar campaign, the Yellow Fish Program, is run by the Armadale Gosnells Landcare Group. You may notice the logo above stencilled on drains in your area or receive a postcard explaining stormwater pollution issues. 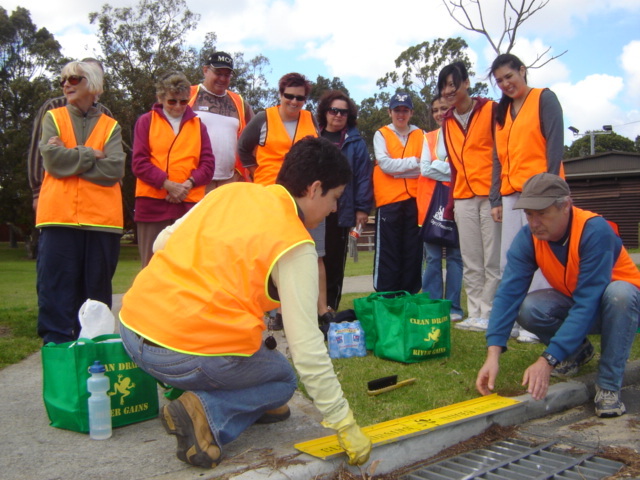 The Drain Stencilling Program is an important part of our campaign and one you or your group can be a part of. The drain stencilling kit is available for use by community groups and other organisations, including businesses, wishing to increase pollution awareness in their area or work place. For information on drain stencilling activities, please contact SERCUL.